At a time when the future of the BBC’s Charter is being debated in public, and with politicians in Cardiff Bay and Westminster looking at the future of the media, this is a crucial time for broadcasting in Wales. This event will look at the key topics emerging from these debates and how they might influence the future of the BBC in Wales. There is certainly a surging tide of policy rising around media issues in Wales in the wake of Charter renewal – indeed across the whole UK. Inquiries, evidence sessions, briefings… It is vitally important that the perspective from Wales is as sharply focused as possible. We must think robustly for ourselves about the kind of media future we want because no one, surely, should have our interests more at heart than we do nor understand better what life looks like from this part of the United Kingdom. 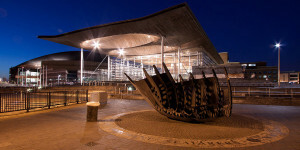 This event comes twenty-four hours before a debate in the Senedd on the recommendations of the Inquiry into the BBC Charter Review by the Communities, Equality and Local Government Committee (CELG) of the National Assembly for Wales. The 11 Inquiry recommendations demonstrate a perceptive grasp of the importance of broadcasting to democracy – and of the role of broadcasting and the media in general. The media enable citizens to collaborate and empathise with one another. 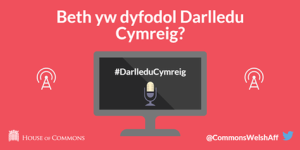 There is an evident determination among Committee members to claim for broadcasting in Wales a future with appropriate autonomy, resources and vision. Amongst their recommendations, ‘as a matter of priority’, is a mechanism which will allow the Welsh Government to keep abreast of, monitor and evaluate Public Service Broadcasting in Wales – ‘an independent media forum for Wales’. They ask for ‘a committee on communications’ to hold ‘media organisations operating in Wales’ to account publicly ‘for the delivery of their responsibilities and commitments in Wales’. Taken as a whole, the recommendations are a confident call for a well-informed government, capable of working transparently to ensure the highest standards in this field, and a communications sector and PSB system which is ambitious, accountable and dynamic – both culturally rich and economically successful. The Committee demonstrates that it values PSB output in terms of both Wales-to-Wales and Wales-to-the-UK (and beyond). It has not opted for an either/or approach. It has shown a grasp of the importance of representation and portrayal in the media, locally and on the network and of the role that commissioning plays in these. It has repudiated any suggestions that Wales is less than world-class in its output. It has called for £30 million of investment into BBC services for Wales. Crucial details of governance, accountability and funding remain to be worked out. The Clementi Review of the Governance and Accountability of the BBC which appeared almost simultaneously with the CELG recommendations, leaves room for debate about how BBC Audience Councils should be composed and operate, particularly in relation to BBC management both at UK and ‘national’ levels. Clementi recommends that each of the ‘nations’ has a representative on a new unitary board and that this person would also chair the Audience Council. Where does that leave the board of management of a ‘nation’? What will guarantee that the new Audience Councils will be any more representative or capable (in the sense of being genuinely empowered) than the present, rather ham-strung versions? Sir David suggests that, for the first time in history, the DCMS could take the power to appoint members of the BBC’s operational board – the proposed new unitary board. Under his proposals, the Chairman, the Vice Chairman and four of the non-Executive Directors – half the board and therefore the majority of the non-executives – could be appointed by the DCMS. I think we need to think very hard about this. What conclusions will hard thinking lead to in Wales? Not only balance but the system of appointment is a delicate matter. Will there be calls in Wales for a Welsh government appointment to a unitary board? Meanwhile the Welsh Affairs Committee Inquiry into Broadcasting in Wales is deliberating the results of its evidence-gathering. It is certainly a period of ‘Watch this Space’!